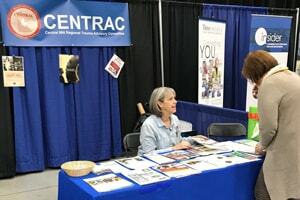 UMASH partnered with the Central Minnesota Trauma Advisory Committee (CENTRAC) to connect with farmers and farm families at the Central Minnesota Farm Show about farm safety and first aid. UMASH safety resources on animal handling, the Farm Safety Checklists, youth work guidelines and safe play areas were available to show attendees in the CENTRAC booth. The CENTRAC staff promoted the Stop the Bleed campaign and demonstrated bystander first aid techniques for how to pack a wound and properly use a tourniquet. Knowing these lifesaving techniques can make the difference if someone is injured on the farm. We look forward to partnering with CENTRAC at other events in the future. Diane Kampa, UMASH Outreach Director, was interviewed by KASM radio to promote Ag Safety and Awareness Program (ASAP) Week, March 4-10, 2018. The farm show was also a great opportunity to network with many of the exhibitors to introduce UMASH and share tips for promoting ASAP week and farm safety resources next week and throughout the year.